Received: August 30, 2018; Revised: November 4, 2018; Accepted: November 5, 2018; Published online: December 31, 2018. Mycobacterium abscessus comprises rapidly growing mycobacteria, and the clinical manifestations of M. abscessus skin infection include papule, nodule, ulcer, scar and mixed form. The cutaneous infections have been reported due to minor trauma, cosmetic therapy, acupuncture and disseminated infection. A 75-year-old man presented with pruritic diffuse various sized erythematous papuloplaques and pustules on the neck and chest for 2 months. The cutaneous lesions were spread around the wound of the shaving on the neck. The histopathologic findings were consistent with abscess showing infiltrations of neutrophils and lymphocytes in the dermis and negative findings were observed on immunohistochemical stain including acid-fast bacilli stain. One month later, mycobacterial culture result showed positive findings, and the pathogen was identified by reverse-transcriptase polymerase chain reaction with hybridization. The patient was treated with combination of clarithromycin and ethambutol for 5 months and there is no evidence of recurrence after 6 months of follow-up. Herein, we report a case of M. abscessus cutaneous infection through minor trauma caused by shaving in the elderly. Mycobacterium abscessus, one of the subspecies of NTM, is an important pathogen due to its increasing prevalence and treatment difficulties due to the potential for multidrug-resistance.1) We report a case of the successful treatment using the combination of clarithromycin and ethambutol of an M. abscessus skin infection of a wound caused by shaving in a patient. A 75-year-old man presented with pruritic, diffuse, variously-sized erythematous papuloplaques and pustules on his neck and chest that had been present for 2 months. The initial lesion was a wound that developed while shaving the hairs on the lateral side of his neck using a wet razor; however, the lesions were spread to his chest in the form of erythematous papuloplaques and pustules (Fig. 1A). He was taking medications for hypertension, renal insufficiency, and stroke. There were nonspecific findings in his family history. Potassium hydroxide tests of the pustules were negative. 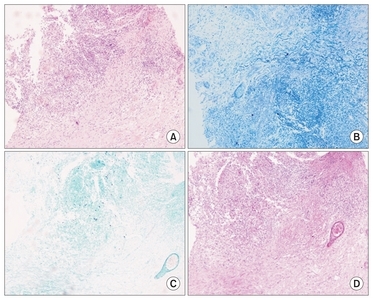 Therefore, a biopsy was performed of the chest lesion and Gomori methenamine silver (GMS) staining; periodic acid-Schiff (PAS) staining; acid-fast staining; and bacterial, fungal, and mycobacterial cultures were performed using the biopsied specimen. No abnormalities were observed in complete blood cell count and routine chemistry. The histopathologic findings revealed neutrophil and lymphocytic infiltrations, which were consistent with an abscess (Fig. 2A), but the GMS, PAS, acid-fast bacilli (AFB), immunohistochemical staining (Fig. 2B–D), and bacterial and fungal culture findings were negative. Itraconazole 200 mg/day and isoconazole cream were used for treatment of a suspected deep fungal infection for 1 month, but there was no improvement. On the 32nd day of mycobacterial culture, NTM were observed and the subspecies was confirmed as M. abscessus by reverse-transcriptase polymerase chain reaction (RT-PCR) with hybridization. We treated the patient with a combination of clarithromycin 1,000 mg/day and ethambutol 800 mg/day for 5 months, and there has been no evidence of recurrence after 6 months of follow-up (Fig. 1B). The patient gave full permissions for the publication of this paper and use of photographs. We experienced a case of primary cutaneous infection caused by M. abscessus in an elderly patient with comorbidities and a history of minor trauma from a razor blade. The lesion might be similar to other diseases such as deep fungal infection and lupus vulgaris. We confirmed the NTM infection and NTM strain using skin biopsy, mycobacterial culture, and RT-PCR with hybridization. Although we could not perform drug sensitivity testing, he was well treated with the combination of clarithromycin and ethambutol. The incidence of NTM skin infections in older adults has been increasing recently. This increase may be due to decreased T cell and cytokine activities with aging, which are important for the pathogenesis of NTM infection.10) Some cases of M. abscessus skin infection have been reported in Korea (Table 1), however, to our knowledge, there have been no other reported cases of M. abscessus infection presenting with multiple and diffuse lesions after shaving in the elderly. Decreased immunity in the elderly could be related to the appearance of multiple and widespread lesions. Papules or pustules at the shaving site among those who shave daily may be easily mistaken for folliculitis. When the lesions do not respond to treatment for folliculitis, it is important to perform the necessary tests to identify pathogens such as NTM. Fig. 1. (A) Diffuse erythematous papuloplaques and pustules on the chest. (B) The lesions were almost cleared after 3 months of treatment with combination of clarithromycin 1,000 mg/day and ethambutol 800 mg/day. DM, diabetes mellitus; OA, osteoarthritis; PCR-RFLP, polymerase chain reaction-restriction fragment length polymorphism; I&D, incision and drainage; C&D, curettage and drainage; RT-PCR, reverse-transcription polymerase chain reaction; HTN, hypertension. Ryu, HJ, Kim, WJ, Oh, CH, and Song, HJ (2005). Iatrogenic Mycobacterium abscessus infection associated with acupuncture: clinical manifestations and its treatment. Int J Dermatol. 44, 846-50. Cassidy, PM, Hedberg, K, Saulson, A, McNelly, E, and Winthrop, KL (2009). Nontuberculous mycobacterial disease prevalence and risk factors: a changing epidemiology. Clin Infect Dis. 49, e124-9. Andréjak, C, Thomsen, VØ, Johansen, IS, Riis, A, Benfield, TL, and Duhaut, P (2010). Nontuberculous pulmonary mycobacteriosis in Denmark: incidence and prognostic factors. Am J Respir Crit Care Med. 181, 514-21. Nessar, R, Cambau, E, Reyrat, JM, Murray, A, and Gicquel, B (2012). Mycobacterium abscessus: a new antibiotic nightmare. J Antimicrob Chemother. 67, 810-8. Uslan, DZ, Kowalski, TJ, Wengenack, NL, Virk, A, and Wilson, JW (2006). Skin and soft tissue infections due to rapidly growing mycobacteria: comparison of clinical features, treatment, and susceptibility. Arch Dermatol. 142, 1287-92. Kothavade, RJ, Dhurat, RS, Mishra, SN, and Kothavade, UR (2013). Clinical and laboratory aspects of the diagnosis and management of cutaneous and subcutaneous infections caused by rapidly growing mycobacteria. Eur J Clin Microbiol Infect Dis. 32, 161-88. Nakanaga, K, Hoshino, Y, Yotsu, RR, Makino, M, and Ishii, N (2013). Laboratory procedures for the detection and identification of cutaneous non-tuberculous mycobacterial infections. J Dermatol. 40, 151-9. Park, S, Kim, S, Park, EM, Kim, H, Kwon, OJ, and Chang, CL (2008). In vitro antimicrobial susceptibility of Mycobacterium abscessus in Korea. J Korean Med Sci. 23, 49-52. Brown-Elliott, BA, and Wallace, RJ (2002). Clinical and taxonomic status of pathogenic nonpigmented or late-pigmenting rapidly growing mycobacteria. Clin Microbiol Rev. 15, 716-46. Ponnappan, S, and Ponnappan, U (2011). Aging and immune function: molecular mechanisms to interventions. Antioxid Redox Signal. 14, 1551-85. Cho, JH, Kim, MY, Park, YM, and Kim, HO (2004). A case of cutaneous infection due to Mycobacterium abscessus. Korean J Dermatol. 42, 512-5. Choi, YL, Lee, KJ, Lee, DY, and Lee, ES (2005). A case of skin infection caused by Mycobacterium abscessus. Korean J Dermatol. 43, 852-5. Han, YJ, Choi, HY, Myung, KB, and Choi, YW (2008). A case of cutaneous Mycobacterium abscessus Infection. Korean J Dermatol. 46, 1657-60. Kwon, YH, Lee, GY, Kim, WS, and Kim, KJ (2009). A case of skin and soft tissue infection caused by Mycobacterium abscessus. Ann Dermatol. 21, 84-7. Chun, SM, Yun, SJ, Kim, SJ, Lee, SC, Won, YH, and Lee, JB (2012). Disseminated Mycobacterium abscessus infection in healthy adult. Korean J Dermatol. 50, 269-72.